The Anti-War Battalion is fired up!!! 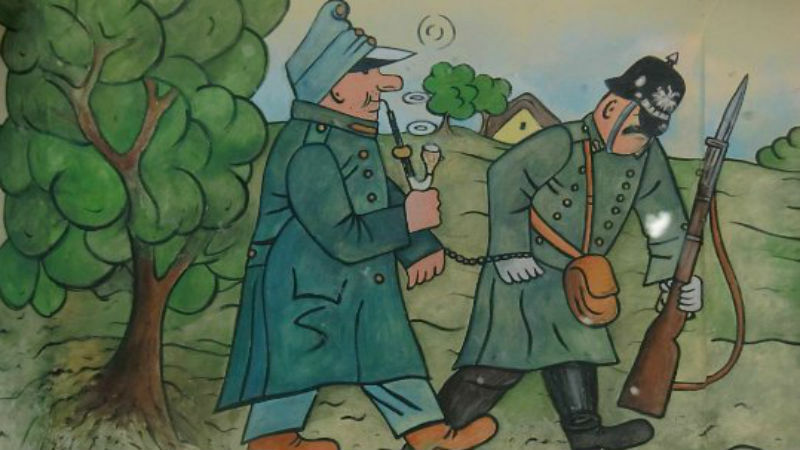 Most literature and theatre fans would instantly recognise Jaroslav Hašek’s The Good Soldier Schwejk, the most translated Czech novel in history, and a world-famous anti-war satire. Cinephiles less so. The book has indeed been adapted to the silver screen a few times – first in 1926 and then again in 1943 by Czech filmmaker Karel Lamač, in 1956 by the also Czech Karel Steklý and finally in 1960 by German filmmaker Axel von Ambesser. The problem is that these films are hardly available in the UK, and no other movies have been made since (except for television). This is about to change, as screenwriter and filmmaker Christine Edzard sets herself on a very ambitious mission. Christina’s film will be neither an ordinary book adaptation nor a period drama selling a fake nostalgia (the type of movies Ken Loach has recently criticised). It is a very personal, audacious and groundbreaking endeavour spearheaded by a woman with a clear artistic vision and unambiguous peace ideology. It will be a very dirty movie in line with our vision and mission of cinema as a transformational tool. DMovies are absolutely thrilled and honoured to bring the details of this very exciting project firsthand to you. Illustration by Josef Lada, from the book The Good Soldier Schwejk. The Good Soldier Schweijk was originally written in four volumes between 1921 and 1923, and it was never completed. The unfinished collection of farcical incidents focuses on the eponymous fictional WWI soldier, his questionable allegiance, the ineptitude of the authorities and – most importantly – the pointlessness of war. The sharp and acrid tone prevails throughout, and the collection is often described as a masterpiece of black comedy. It’s one of those ultra-subversive books, which remains relevant and urgent nearly a century later. 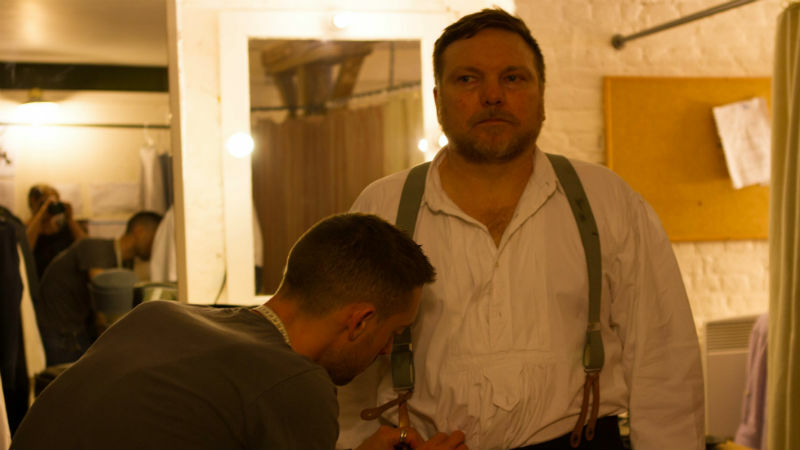 It has been very popular with playwrights throughout history, with adaptations by Bertold Brecht and Joan Littlewood, to mention just a few names. There have also been several versions on television and radio in the UK, Germany, Finland and beyond. Unsurprisingly, the novel’s mockery of war has not been very popular with warmongering and authoritarian regimes. Hitler infamously prohibited and burnt all the copies available at Bebelplatz in Berlin, where the Nazi book burning memorial now stands. It was also banned by the US Armed Forces. No books were ever burnt in the UK, but it’s extremely unlikely that Churchill, Margaret Thatcher or Tony Blair ever read it. 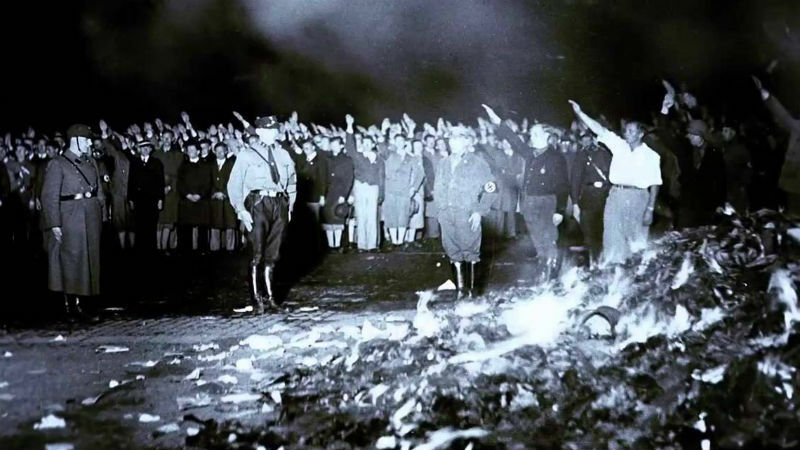 Books being burnt by the Nazis at Bebelplatz, in Berlin; The Good Soldier Schwejk was amongst them. DMovies attended the play, which was fully interactive and filmed throughout. There were cameras strategically placed in various parts of the theatre capturing the reactions from the audience. Actors often appeared at the back of the theatre and they even sat down and mingled with the theatre-goers. We were given names of modern weaponry (those unpronounceable ones, such as AK47s and so on) and asked to shoot them out. In the metaphorical sense, of course: we were asked to shout the names out as loud as we could. You have probably gathered by now that no guns were ever triggered and no one got hurt. The cast included Alfie Stewart (as Schwejk), Joe Armstrong, Kevin Brewer, Sean Gilder, Michael Mears Aaron Neil, Andrew Tiernan, Shona McWilliams and Michele Wade. Andrew and Shona are very well known to DMovies: we recently screened his deliciously dirty and dystopian sci-fi UK18 in central London – the movie was directed by him and starred by her. 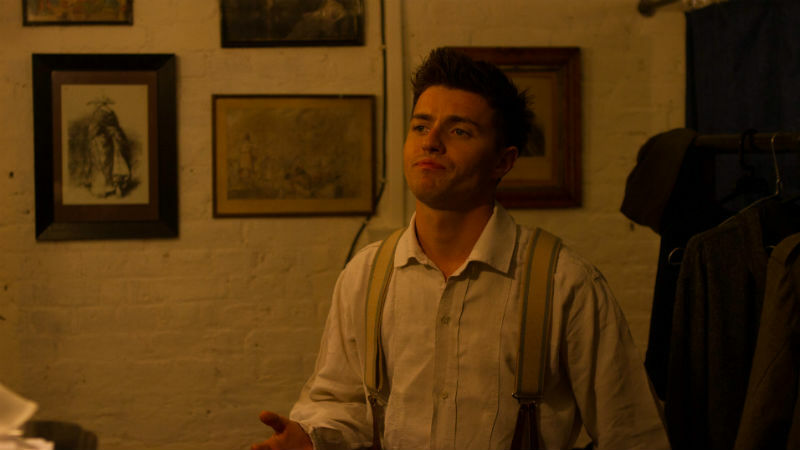 Alfie Stewart is the protagonist of our anti-hero saga. 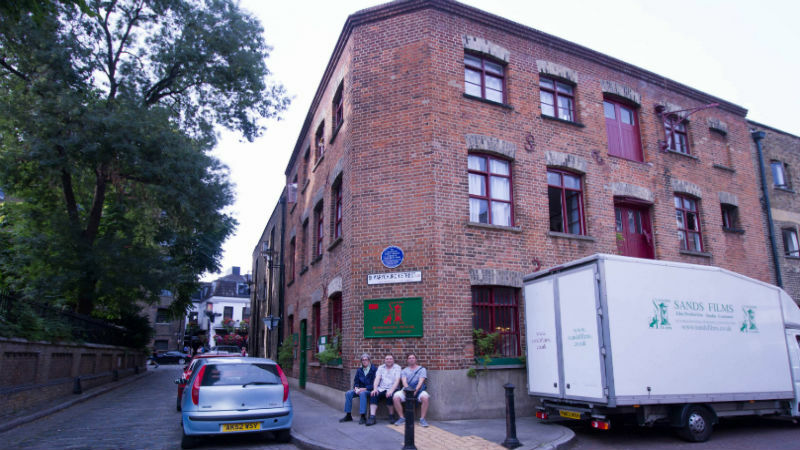 The charming Sands Films as seen from outside, in Rotherhithe. Andrew Tiernan gets prepared to perform. So, what’s it that will be so special about The Good Soldier Schwejk? Well, it’s not a film set in the past. After years of research, Christine has added her very own personal twist to the play/film by blending in absurd quotes from very real, modern sources. 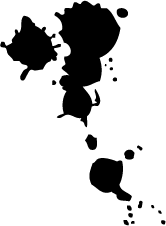 The clumsy, ludicrous, wacky and preposterous words you will hear came from the mouths of Tony Blair, George W Bush, Colin Powell, Cofer Black and other wll-known figures. The conversation are sometimes so bizarre that they feel like five-year-olds squabbling, exposing the sheer absurdity of reality. There are also bits from George Bernard Shaw, Oscar Wilde and Alfred Nobel. While the authors are mentioned at the end of the play, the individual quotes are never attributed to them, making it borderline impossible to identify who said what. But this does not make the play disjointed, quite the opposite. It gives it a strangely smooth feel. 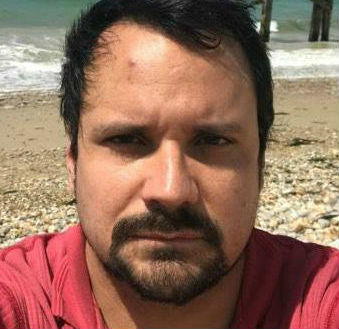 The idiocy of war is both anonymous and conspicuous, and it’s also intoxicating. Christine is now working on the final product: The Good Soldier Schwejk, a film like no other before. Its singularity doe not lie solely in the “modern twist”, but also in the fact that the movie will fuse cinema with live theatre. In fact, Christine is no stranger to innovation. Little Dorrit, which was made mostly within the confines of Sands Films, was so inventive that it landed her an Oscar nomination for screenwriting. We expect no less from her latest endeavour. 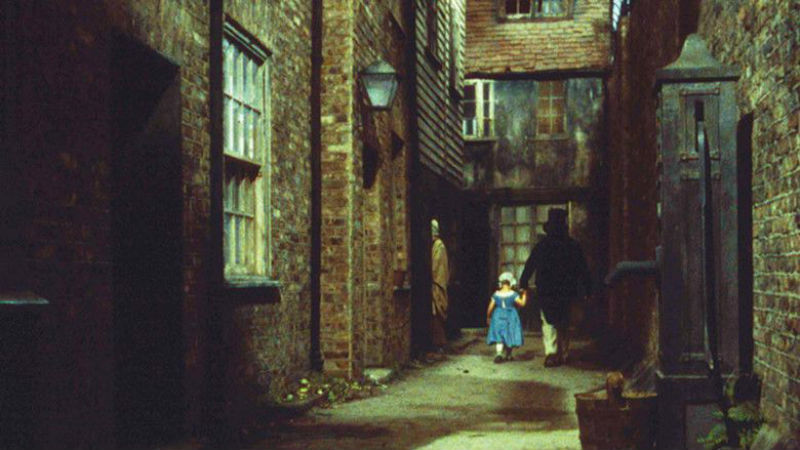 Still from the Oscar-nominated 1987 movie Little Dorrit. Olivier tells us about the political connotations of the movie: “It’s a type of protest. A protest against the fact that our society is drifting towards war right now as we speak. All of us, including middle class and educated people, are letting it happen. It’s down to us to stop it. We have to do something about it! So, what’s happening next? Christine explains: “We’ve got lots of work to do, we have 60 hours of footage plus the shooting we’re doing this week. So I don’t think we can announce a date at this stage.” But don’t worry, DMovies will be keeping a close look and let you know about the latest developments. So stay tuned! 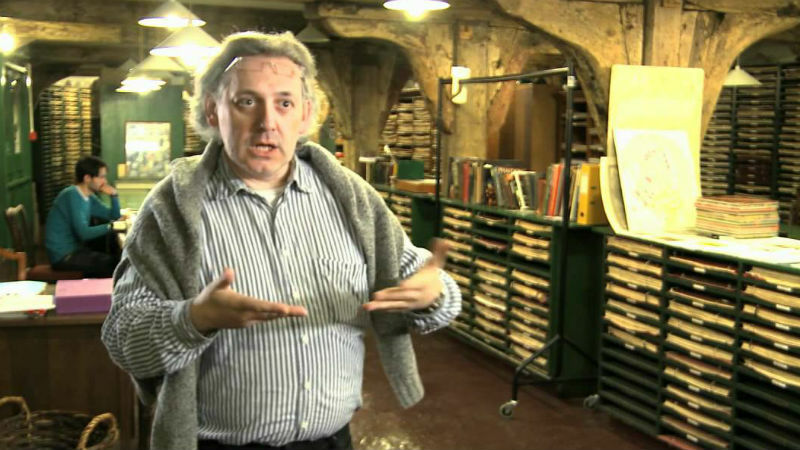 Olivier Stockman at Sands films; you can see the ship timber holding the building roof.